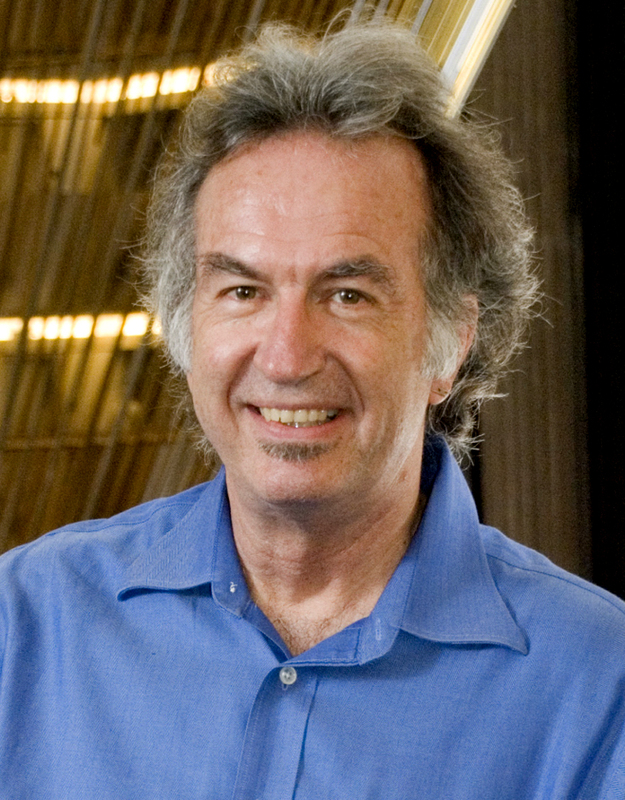 Today I’m delighted to bring an interview with William Stout. A well known artist in his own right with movie posters, comics and sci fi credits to his name, he also has a major ‘sideline’ in dinosaurs and fossil animals. As ever please respect this artwork and don’t use it or link to it. I have it on generous loan from William. I’ve been drawing since I was a child. I planned to be a doctor and was a science/math major in high school, hence my unusual (for an artist) proclivity for understanding and enjoying scientific papers. I changed my major to art my last semester of high school and went to the California Institute of the Arts (CalArts; aka the Chouinard Art Institute) on a full California State Scholarship that I received based upon my perfect math and English scores on the SATs (as well as my family’s dire poverty). The Chouinard Art Institute’s illustration department had a great policy that allowed us to turn in the jobs we obtained in the real world in lieu of our homework. Nearly everything I turned in my last two years at art school were real jobs. I have been a supporting myself with my art since 1968, when I was 19 years old. I’ve been drawing dinosaurs since I was in the third grade. I didn’t really start doing accurate reconstructions, though, until I joined the SVP in the late 1970s. At that time I began to seriously study both paleontology and paleobotany. My parents took me to the Reseda Drive-in to see my first movie when I was three years old. It was a re-release of the original 1933 King Kong. I think it did damage at a genetic level! Not long after that I saw the Rite of Spring sequence in Fantasia. It’s been dinosaurs, dinosaurs, dinosaurs ever since. As far as art goes, I’ve been drawing since I was a child. Again, I think it was the Disney cartoons that primarily got me interested in drawing and art as a child. There are a few that are important to me. 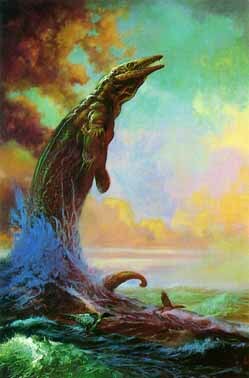 One is “Mosasaur and Loons” [below], one of my prehistoric Antarctica paintings. It’s incredibly simple and powerful (always difficult to do). It has excellent color as well. After making it into a poster it has never stopped being one of my top sellers. It was the reason I got my first mural commission as well. The Smithsonian’s Michael Brett-Surman gave me what I consider the greatest compliment I have ever received for a painting in regards to that piece. An Albertosaurus picture I did was a real breakthrough for me as far as helping me to understand dinosaur poses on a whole new level. It is still one of my favorites. I also really love my Oligocene mural at the San Diego Natural History Museum. It was one of the last of the twelve SDNHM murals I painted, so it exhibits the skills I acquired in painting the others. It has a very successful color scheme that I had never used before; that always makes me happy. You need to see it in person; the reproductions don’t do it justice. There are passages throughout the painting that remind me of one of my painting idols, American landscape painter Thomas Moran. 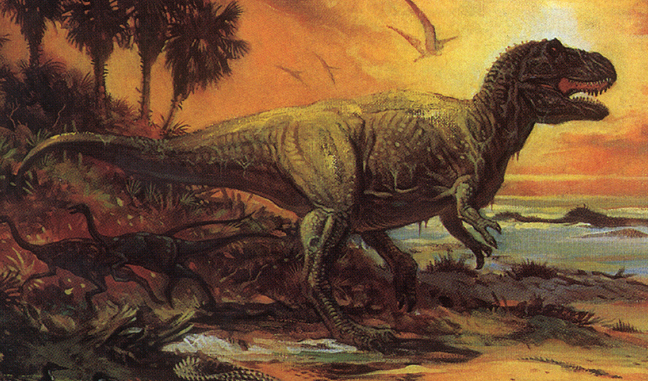 My favorite paleoartist is Charles R. Knight. He beautifully combined both great art and good science. His color was wonderful and he was really terrific at creating a great mood. And, man, did he know animals! All kinds, too, but he was especially talented at depicting dinosaurs as well as the big cats. 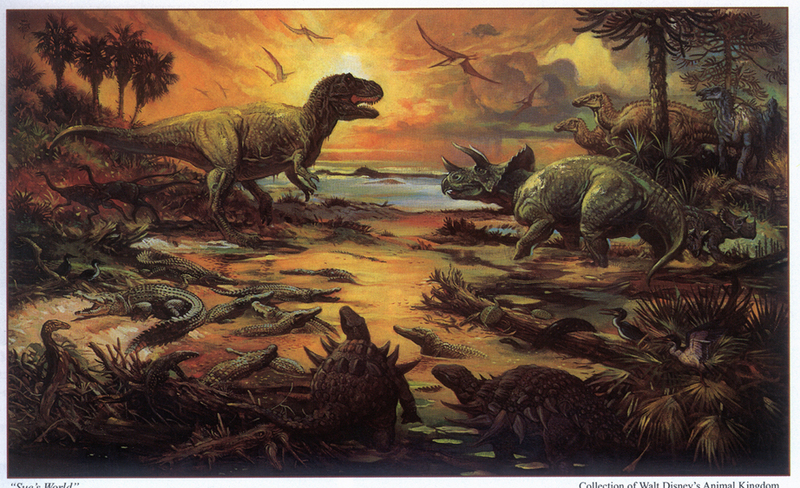 My favorite piece of paleoart…Hmmm…One that comes immediately to mind is a painting by my friend John Gurche. I think it is one of the most brilliant paleoart concepts I’ve ever seen. It is a painting of the first fish coming out of the water as seen from the point of view of the second fish. The bravery of the fish is emphasized, as it is leaving the comfort and safety of the water, and heading into its environmental antithesis: a harsh, dry environment baked by the sun. To add the final frosting to this rich cake, John has designed the setting so that there is a bend in the path directly ahead of the fish. This bend creates a tension, a mystery, asking the question, “What surprises, deadly or benevolent, await this brave soul around that turn?” Brilliant! I wish I’d thought of it! My absolute favorite is Tyrannosaurus rex, although I love the beautifully elaborate horn display and ornamentation of Styracosaurus. 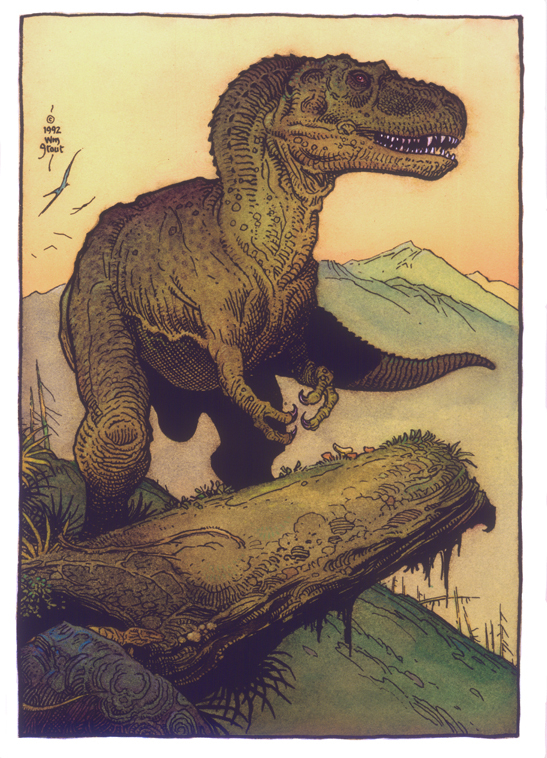 My T. rex love must come from my early exposure to King Kong and Fantasia and the murals of Charles R. Knight. I was pleased to have been selected (by Walt Disney Imagineering for Walt Disney’s Animal Kingdom) to do the first reconstruction of Sue [above and below]. I immediately consulted with the preparators at the Field Museum to find out Sue’s pathologies so that I could incorporate them into her reconstruction. I didn’t want to just paint another T. rex — I wanted my portrait of Sue to be that particular T. rex. I would love to do more Triassic stuff. That’s still a pretty much untapped paleogenre, except for Doug Henderson’s magnificent book on the subject. We had some very bizarre creatures back then. Combining great art with good science. Typically, most paleoart has one but not the other. Bill would be my favorite modern artist full stop. I grew up drawing Stoutian dinosaurs and other creatures all over my books in school and his “The New Dinosaurs” had a profound influence on my art. Thanks for the interview Dave! Anyone think the T.rex looks kinda like the one in Dinosaur Revolution? I know William isn’t responsible for the design in the show, but I just couldn’t help notice the similarities. Fantastic post. I love that King Kong had a clear genetic impact. Wonderful interview.